This blog was originally posted in November 2015, but a client recently asked a question about how to match volunteers needing flexibility with staff members who need shot term assistance with small projects. Of course, I thought of this post. We are sharing it here. What’s worse than having a job to do and no volunteers available to do it? 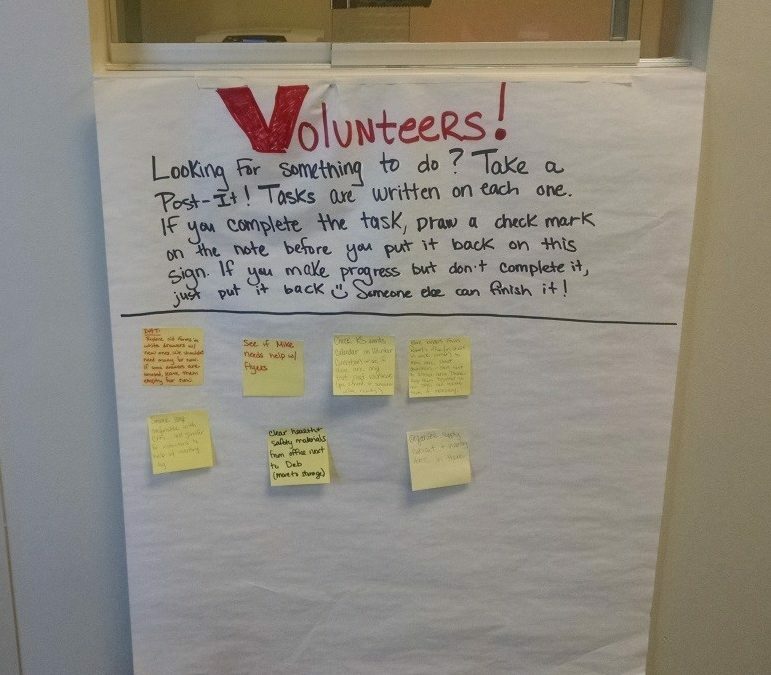 Having volunteers show up and not having meaningful work for them do – that’s what! Recently, at the Points of Light Conference on Volunteering and Service, I met one volunteer coordinator who shared an elegantly simple solution to ensuring both that volunteers always have meaningful work and that staff can easily and efficiently get needed assistance. Debra Tucker is Regional Volunteer Coordinator for the Kansas/Nebraska/Southwest Iowa region of the American Red Cross. She shared a strategy that her office has instituted to engage volunteers between disasters. Given her organization’s mission, engaging volunteers during times of crisis is pretty easy, but keeping volunteers engaged during “blue skies” is an ongoing challenge. At a regional meeting last July, Debra was at a table with a dozen staff members from different service areas and they were tasked with brainstorming ways to address this engagement challenge. She and her colleagues had an “aha” moment when they realized that, while engaging skilled volunteers certainly builds their capacity, it is often little tasks that impede productivity during the day. Tasks such as reshelving books, breaking down boxes for the recycling bins, assembling training manuals, organizing and taking inventory of program supplies, and data entry often take staff time away from other work or pile up and serve as a source of stress for staff. They recognized that these tasks are too varied and unpredictable to comprise a new volunteer position, but that getting help with these emerging tasks would still be highly valuable. “Wouldn’t it be great if we had a task board that we could use to simply post these little tasks?” one person asked. And, thus, the Task Board was born. After presenting the idea to the full regional meeting, leadership planned to take all the suggestions back to the office, sort through them, and send them back out throughout region. But, Debra’s chapter didn’t want to wait. She and her colleagues decided to pilot this idea and have been implementing it (and loving it!) for about three months. Looking for something to do? Take a Post-It! Tasks are written on each one. If you complete the task, draw a check mark on the note before you put it back on this sign. If you make progress but don’t complete it, just put it back. J Someone else will finish it! That’s the whole system. And it works. Now, as tasks arise (and they do arise on a daily basis), staff simply write a task on a sticky note and post it on the board. Volunteers often have extra time before or after their training sessions, have a few extra minutes before another assignment, or drop by looking to be helpful. Now they always can find something helpful to do. They complete the tasks, make a big check mark on the sticky, replace the note, and move on to another task. At American Red Cross, volunteers self-submit their hours and work through the organization’s system, Volunteer Connection, so volunteer efforts are tracked online. Staff always has an easy way to post needs and get help. Volunteers always have something to do without having to interrupt staff. Volunteers can choose tasks that fit their interests, skills, and comfort level. It is user-friendly and costs nothing. It makes her job as Volunteer Coordinator easier as well; when colleagues approach her and ask, “Can you find someone to help with…. ?” More often than not, she simply can suggest they post it on the board.